The Downhill season is coming and we've finally put the S36 into serial production. Homegrown Downhill supremacy, designed and tested in Sheffield's notorious S36 postcode zone. On One doesn’t have any world cup racers in our roster, we may not be getting sideways like Brendan or nailing the fastest laps like Gee, but on occasion, we can get a bit loose and do it with a big smile. We are here for the good times and that’s exactly what the S36 is all about. It was the bike we all wanted to produce but were never sure if it was a model our core customers would be interested in. When we first released photos last year on Instagram, we were inundated with calls from customers showing their interest in the product. We knew then that we might have unearthed a market for a seriously cost effective downhill focussed sled. Initial sampling started over a year ago and took the On One team to various locations across the country including Fort William, Revolution Bike Park and, of course, S36 itself, Wharncliffe Woods. This is Steve Peat’s backyard and training ground so we felt it was the perfect place to test and gauge interest from local riders. There have been a lot of legs thrown over the S36 in the past 12 months and it's been railed, roosted, rallied and thrown down the trails more than any bike we've ever built and now it's ready for you! 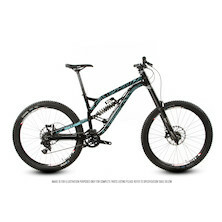 The S36 is our first downhill rig and designed to tackle anything that you'd dare ride. Running on 27.5 wheels and sporting 200mm of exquisitely damped travel front and rear. It’s long and low in every size so it rolls fast, eats up the bumps and rails the turns. With a 63-degree head angle when things get steep, this bike will keep on tracking straight and true. If you're going to Peaty's Steel City this weekend we'll see you there; we've got the bomb hole line aced! We've launched the S36 in a SRAM GX DH spec. 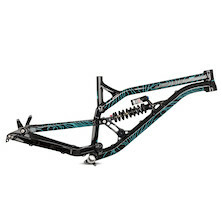 This first model comes equipped with a solid spec including a Boxxer RC, Kage shock, and Guide R brakes. We're still thinking about what a pro spec version should look like, if you have an opinion on what you'd like to see on our top spec S36 let us know and we'll add it into the mix.